The Grumman A-6 Intruder was an American, twin jet-engine, mid-wing all-weather attack aircraft built by Grumman Aerospace. In service with the U.S. Navy and U.S. Marine Corps between 1963 and 1997, the Intruder was designed as an all-weather medium attack aircraft to replace the piston-engined Douglas A-1 Skyraider. As the A-6E was slated for retirement, its precision strike mission was taken over by the Grumman F-14 Tomcat equipped with LANTIRN pod. From the A-6, a specialized electronic warfare derivative, the EA-6 was developed. The definitive attack version of the Intruder with vastly upgraded navigation and attack systems, introduced in 1970 and first deployed on 9 December 1971. The earlier separate search and track (fire control) radars of the A-6A/B/C were replaced by a single Norden AN/APQ-148 multi-mode radar, and onboard computers with a more sophisticated (and generally more reliable) IC based system, as opposed to the A-6A's DIANE discrete transistor-based technology. A new AN/ASN-92 inertial navigation system was added, along with the CAINS (Carrier Aircraft Inertial Navigation System), for greater navigation accuracy. Beginning in 1979, all A-6Es were fitted with the AN/AAS-33 DRS (Detecting and Ranging Set), part of the "Target Recognition and Attack Multi-Sensor" (TRAM) system, a small, gyroscopically stabilized turret, mounted under the nose of the aircraft, containing a FLIR boresighted with a laser spot-tracker/designator and IBM AN/ASQ-155 computer. TRAM was matched with a new Norden AN/APQ-156 radar. The BN could use both TRAM imagery and radar data for extremely accurate attacks, or use the TRAM sensors alone to attack without using the Intruder's radar (which might warn the target). TRAM also allowed the Intruder to autonomously designate and drop laser-guided bombs. In addition, the Intruder used Airborne Moving Target Indicator (AMTI), which allowed the aircraft to track a moving target (such as a tank or truck) and drop ordnance on it even though the target was moving. Also, the computer system allowed the use of Offset Aim Point (OAP), giving the crew the ability to drop on a target unseen on radar by noting coordinates of a known target nearby and entering the offset range and bearing to the unseen target. In the 1980s, the A-6E TRAM aircraft were converted to the A-6E WCSI (Weapons Control System Improvement) version to add additional weapons capability. This added the ability to carry and target some of the first generation precision guided weapons, like the AGM-84 Harpoon missile, and AGM-123 Skipper. The WSCI aircraft was eventually modified to have a limited capability to use the AGM-84E SLAM standoff land attack missile. Since the Harpoon and SLAM missiles had common communication interfaces, WCSI aircraft could carry and fire SLAM missiles, but needed a nearby A-6E SWIP to guide them to target. In the early 1990s, some surviving A-6Es were upgraded under SWIP (Systems/Weapons Improvement Program) to enable them to use the latest precision-guided munitions, including AGM-65 Mavericks, AGM-84E SLAMs, AGM-62 Walleyes and the AGM-88 HARM anti-radiation missile as well as additional capability with the AGM-84 Harpoon. A co-processor was added to the AN/ASQ-155 computer system to implement the needed MIL-SPEC 1553 digital interfaces to the pylons, as well as an additional control panel. After a series of wing-fatigue problems, about 85% of the fleet was fitted with new graphite/epoxy/titanium/aluminum composite wings. The new wings proved to be a mixed blessing, as a composite wing is stiffer and transmits more force to the fuselage, accelerating fatigue in the fuselage. In 1990, The decision was make to terminate production of the A-6. Through the 1970s and 1980s, the A-6 had been in low-rate production of four or five new aircraft a year, enough to replace mostly accidental losses. The final production order was for 20 aircraft of the SWIP configuration with composite wings, delivered in 1993. 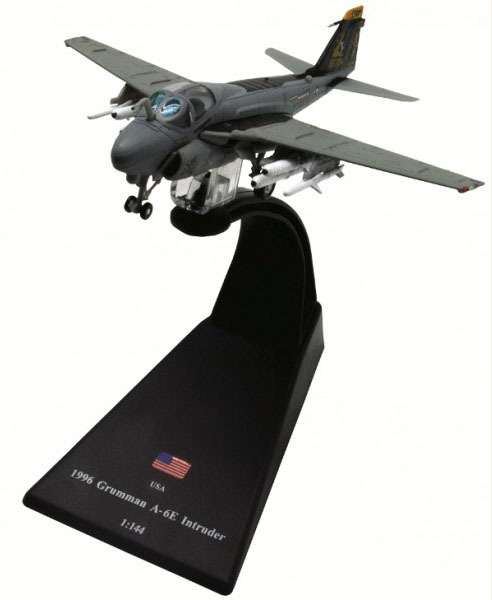 A-6E models totaled 445 aircraft, about 240 of which were converted from earlier A-6A/B/C models.